Our whole family is obsessed with Transformers as you already know. So I jump at any chance I get to review anything that has to do with Transformers! I was psyched to hear we would have the opportunity to review the newest Transformers Rescue Bots: Adventures in Time and Space! On February 23rd, 2016, Shout Factory Kids, in collaboration with Hasbro Studios, released this awesome new collection on DVD! 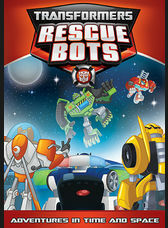 The synopsis says "Griffin Rock’s Autobot first responders — Chase, Heatwave, Blades and Boulder — are back for five more action-packed adventures! Only this time, they’re proving that they’ll stop at nothing to protect their Earth friends, even if it means traveling through all of time and space!" The boys have tons of transformer toys of all sizes and are constantly watching the shows while playing with them at the same time. This DVD includes five episodes for the kids to watch and not only are Dane and Declan now totally obsessed with this DVD, but it has been a way of bringing us all together during movie/TV time. The kids love the action and its a more appropriate version than the actual movies which are geared more towards adults. Giveaway: Shout Factory is going to give one of A Lucky Ladybug's lucky readers a Transformers Rescue Bots: Adventures in Time and Space on DVD to have of their own! my sister boys love them!! watch them at our home all weekend!! i'm not sure if they have a fav they love all of them!! they and thier uncle would be tickled if we won!! My son's favorite transformer is Dozer (not sure on spelling). So my family is crazy for Optimus Prime. My sons favorite transformer is bumblebee. I can remember my daughterl liking Bumble Bee. My son's favorite character is BumbleBee. i like optimus prime. he is our favorite. My sons favorite one is smokescreen,but he loves them all.